We are delighted to let you know that our new CD, called "Greenfields Live In Harmony" is being released on June 28th. We will be holding a special concert in school on Tuesday 28th June to launch the CD. Tickets are avilable from the office. 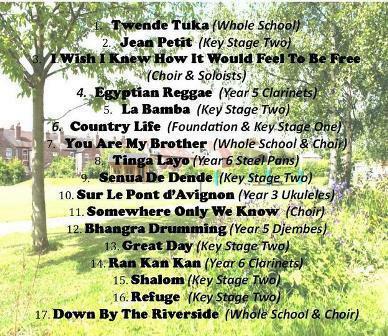 The CD, called “In Harmony”, features sixteen songs and includes all of the children in school, as well as some instrumental pieces played on clarinets, drums and steel pans. Copies of the CD will be available at the concert for a bargain of price of £4.00. If you wish, you could buy both CDs for a special one-off price of £6.00!! We are really proud of all of the hard work that has gone in to recording the songs and are sure that you will love hearing the children sing and play so well. We look forward to seeing you at the concert and are sure that you will love the CD.